Learn a little bit about our RAD staff and what they do in their roles with Residential and Dining Services. 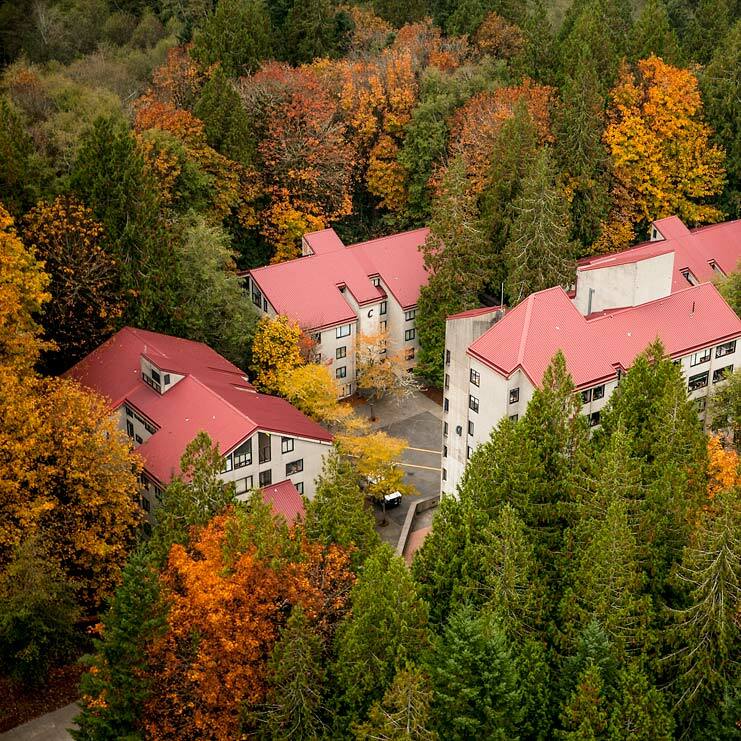 The Director of Residential and Dining Services provides strategic leadership and is responsible for the residence halls and dining services at Evergreen. The Director supervises two assistant directors, facilities and residential life, and provides leadership to eight full-time professional staff and approximately 75 to 150 undergraduate staff members in Residential and Dining Services. The Director of Residential and Dining Services reports to the Vice President of Student Affairs. Bio: I enjoy working with Greeners and have been working at Evergreen for the past eight years. I grew up in Vermont and earned my BA in secondary education and my Masters of Education degree in Higher Education and Student Affairs, both from the University of Vermont. Prior to coming to Evergreen in 2008, I worked in Residence Life at Reed College in Portland Oregon for 12 years. Working at a small campus, I like to be involved in many aspects of the college community and make a difference to this community that I call home. I serve on a variety of committees and enjoy watching all of our student workers learn and grow, and leave Evergreen to find their dream jobs. In my spare time, I enjoy exploring the Pacific NW, growing my own food, playing with my family, and taking time to enjoy the wonders of Olympia. The Assistant Director for Residential Life is responsible for the daily administration and management of the residence life program consisting of approximately 900 students living on campus. The Assistant Director supervises four professional full-time staff and provides leadership to approximately 20 undergraduate staff members. The Assistant Director has responsibility for occupancy management, emergency planning and assessment. The Assistant Director for Residential Life reports to the Director of Residential and Dining Services. Bio: While I have lived on both coasts in the United States and in the Midwest, the Pacific Northwest is new for me. I am excited to be here and enjoy being near the water and mountains again. I focused on Gender & Women’s Studies for my undergraduate work at Scripps College in Claremont, CA. I then completed my master’s work at Indiana University in Bloomington, IN with a focus on Higher Education & Student Affairs. I have worked in residential life throughout my career at both small liberal arts colleges and large research institutions. I am excited to work with and learn from Greeners during my time here. Outside of work I like kayaking, hiking, board games, and vegetarian cuisine. Resident Directors (RDs) are professional staff often with graduate degrees who live and work in the residential community in order to facilitate a safe and inclusive living and learning environment for residents. Each RD directly oversees the administration and development of our residential community, and supervises a staff of Residence Life Student Staff (RL). RDs report to the Assistant Director for Residential Life. Resident Directors are available to meet with residents and their offices are located on the 3rd floor of Building A.
Bio: Hello, I am excited to begin my first year at Evergreen as a Resident Director. I grew up in central Wisconsin and attended the University of Wisconsin-Superior studying sociology and psychology. I continued my education and received a Masters of Arts degree in Leadership in Student Affairs from the University of St. Thomas in Minneapolis, Minnesota, while also working as a Hall Director. I have a passion for helping students learn, grow and develop throughout their learning experience and being a resource in many ways to help them be successful. I am excited to work with the Greener Organization (GO), RLs and with residents to make living on campus a positive, safe and enjoyable experience for all. Bio: Hello! I am a Resident Director here at Evergreen! Before coming to PNW I did my undergrad at Rhodes College in my hometown of Memphis, TN in Theatre & Gender and Sexuality Studies, where I focused on performance as a means of protest. I completed my M.Ed. in Higher Education Administration at North Carolina State University, where I focused on academic safe spaces. My practices are rooted in authenticity and self-authorship, and I am excited to continue to learn and grow at Evergreen. In my freer time, I like to rock climb and hike and to explore new places and find new foods! Bio: Though born in Spain on a naval base, I grew up mainly in Illinois. Originally a resident of the Midwest Coast, I not only lived in Chicago but as far west as Mt. Carroll and as far south as Champaign where I completed my undergraduate degree at UIUC in Religious Studies. After working at the Illinois Mathematics and Science Academy for five years as a Resident Counselor, I decided to pursue a Master’s education in College Student Affairs at Nova Southeastern University in Ft. Lauderdale. There I worked as the Assistant Area Coordinator of their Graduate Apartments. From the East Coast to the West, I’m happy to be working and Living at Evergreen as a Resident Director. My hobbies include tabletop roleplaying, board games, comics, cooking, and outdoors activities like backpacking and canoeing. My academic interests are art history (especially Italian Renaissance and Baroque), literature (especially Russian and English), languages (I speak four additional languages poorly), and the history of religion. The Program Support Supervisor for Residential and Dining Services is responsible for providing staff support to the Director and office, as well as administrative support for other professional staff in the department; coordinating the day to day operations of the room assignment process; managing the front office operations including the selection, training and supervision of student assistants; and working closely with Residential and Dining Services staff in a team environment to facilitate effective completion of tasks and assignments. Bio: I have lived in southwest Washington all of my life and graduated from Evergreen with my Bachelor’s degree in 2013 and a Master of Public Administration degree in 2015. Before my formal education I spent over 30 years as a business manager with both private and non-profit companies. After being a student worker in the front office of RAD for more than 3 years, I was delighted to get the opportunity to continue working for this great educational institution while supporting the growth and development of other students. I spend my free time traveling, baking and enjoying everything (especially the wines!) this region of the country offers. The Fiscal Specialist provides services related to room billing, payroll, purchasing, and department budgeting. This person reports to the Director of Residential and Dining Services. The Residential Information Technology manager provides planning, implementation and maintenance of information technology resources. This person supervises six student Resident Technicians. He is responsible for network and communications infrastructure, databases, web applications, and technology support services. Bio: I grew up in Bellingham, Washington and graduated from the Evergreen State College. After a stint in the private tech sector, I returned to Evergreen where I worked in several technical capacities before coming to Housing. I enjoy working with brilliant Evergreen computer science students (aka the ResTechs) developing creative solutions to Housing's information management needs. I spend my free time with my family in the mountains, on the water, and in my yard growing organic vegetables and barbecuing cheeseburgers. The Buildings/Grounds Supervisor oversees day-to-day operations of custodians, grounds, residential maintenance (day and night), linen, auxiliary services and the key shop. This person supervises two professional positions, acts as in-house project foreman and provides leadership to 45 to 150 student staff, depending on the season. The Buildings/Grounds Supervisor reports to the Assistant Director for Residential Facilities. The Maintenance Mechanic and Locksmith builds and fixes things when he is not managing keys and locks. Bio: I’m just a Pacific Northwest boy, born and raised. I grew up in Seattle and ended up coming down to Olympia for school, where I fancied myself a scientist and studied chemistry. I started working for RAD as a student in 2010 and had been working in construction for about 5 years prior to that. Working in the student worker program I found that I love nothing more than passing on my knowledge to those around me. However, I much prefer the company of dogs over humans. I’ve learned a lot from my time at RAD, so far I feel my biggest accomplishment was hanging three doors in one day. In the future I look forward to hanging more doors and spending time with my two kids and my dog. The Engineering Technician provides heating, ventilation and air-conditioning (HVAC), electrical, plumbing and AutoCAD services. This person reports to the Maintenance/Custodial Supervisor.